Before I get started with this review, I just wanted to say a quick apology for the unintentional radio silence! I've been super busy working on various jobs and projects so time has completely got away from me. I looked at the calendar today and was surprised to see January is almost over, and it's been almost two weeks since I last posted here... ooops! I still have a never-ending list of products to review and posts I want to write - hopefully I'll get around to it all eventually! Today I thought it was about time to review of one of my favourite products! I've been a fan of Balance Me for a long time so I couldn't resist picking up a few things on sale about 4/5 months ago. 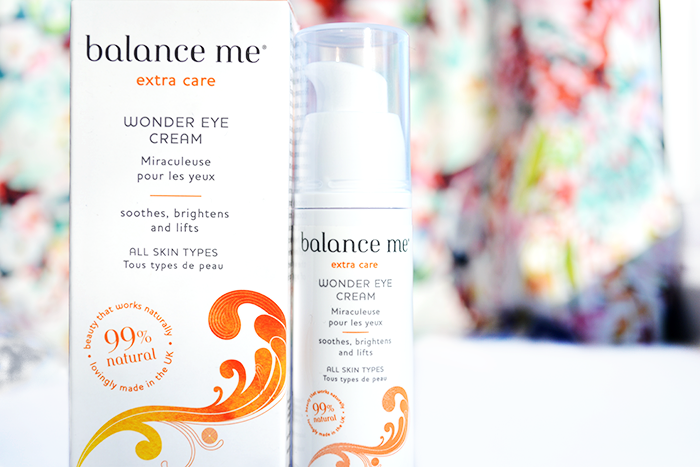 I've briefly mentioned their Wonder Eye Cream in my September Loves when I had the old tube packaging and I've already repurchased a back-up with the new pump dispenser - funnily enough the only products I've ever kept back-ups of are from Balance Me, so I think that's a definite sign they must be good! One of the main reasons why I love this eye cream so much is how light it feels in texture. I think I was going a bit wrong with eye creams in the past that were much too heavy for me so they were blocking pores, but I've noticed a huge reduction in those pesky little milia since switching to this one. Despite the fact I would describe it as a light eye cream, it's surprisingly still hydrating enough to leave me with seriously smooth skin around my eyes. To use, you only need the smallest amount, gently tapping around the eyes with the ring finger. It has a light, slightly citrusy scent and I especially love using this in the mornings as it has a cooling effect. It also seems to subtly brighten up the eye area and it's said to reduce the appearance of fine lines, although only being in my twenties I can't comment on that one just yet! I honestly can't sing the praises of this eye cream enough, especially for the quality and since it's 99% natural too (see here for full ingredients list). It's easily one of the best eye creams I've tried and I'll be keeping it in my routine for a long time yet! A 15ml bottle costs £20, which is a bit outside of my usual budget, but it's another one of those products I would say is totally worth it! I always keep my eye out for sales too, especially at lookfantastic.com where I picked this up for only £12 a few weeks ago - definitely something to keep in mind if you're on a budget too! Have you tried any Balance Me products before? What's your favourite eye cream? I love Balance Me! I went to one of their beauty events once at Debenhams, the ladies where so lovely and inspirational and the products in the goody bag where very impressive! I'm in love with their toning oil :) I have two travel size versions of these eye creams, I have not had a chance to try them yet but your post has just convinced me to dog them out! I have had so many samples of this eye cream but I have never used it! I love Balance Me. I use their manuka honey radiance mask. Smells so good! I'm always looking out for eye creams so if I spot this gem I'm TKMaxx then I'll be grabbing it. I've been seeing the brand Balance Me bouncing around the blogosphere recently. I'll definitely have to take a look!